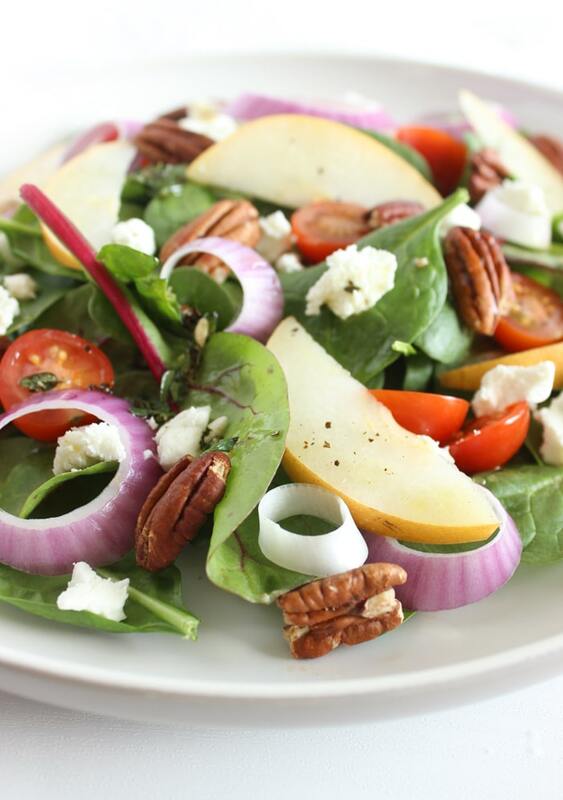 Say goodbye to boring salads with this fresh and flavorful Spinach Pear Salad with Goat Cheese! Iceberg lettuce, mealy tomatoes, and a couple pieces of cucumber all topped with a thick and creamy dressing. Does that salad sound enticing to you? Do you know the number one complaint I hear from people about why they don’t eat salad? “It’s boring!” And if you envision salad the way I’ve just described above, then you might be right. Sure, day after day it can be mundane to sit down to a plate of lettuce with the same toppings, especially if they’re out of season vegetables that don’t spark your taste buds. But as I’ve shown you in the past, salad doesn’t have to be a mediocre appetizer or dieter’s main dish. Take for example my Strawberry Arugula Salad with Fennel, Toasted Almonds, and Strawberry Champagne Vinaigrette or this Salmon Waldorf Salad with Citrus Yogurt Vinaigrette. These salads are anything but boring! They’re full of a flavor and texture, and they are well balanced in both regards. There’s crunch and creaminess, there’s sweet and sour, and best of all there’s freshness. And today’s Spinach Pear Salad with Goat Cheese is no different! People are often surprised that my girls eat salad, but this is the reason why. When you make a flavor-packed recipe that has something for everyone, and looks pretty too, you’re more likely to get everyone at the table to taste it – even if it’s just a bite or two. And sometimes that’s all I get from my girls – a taste of the salad before they say “no, thank you” and move on to the main course. Other times, they eat it all up and ask for seconds (especially when they’re ravenous and the main course isn’t ready yet! Great trick to get the kids to eat salad, huh?!). 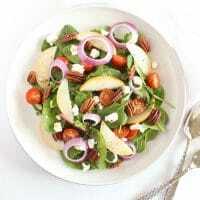 As with all salad recipes, this spinach pear salad with goat cheese can be modified as you see fit. You can absolutely swap in different greens, eliminate the cheese and/or nuts if there are allergies or intolerances, and make any other changes based on taste preferences. That said, the flavor combination I have here works really well, so if you’ve never tried it, I hope you will! 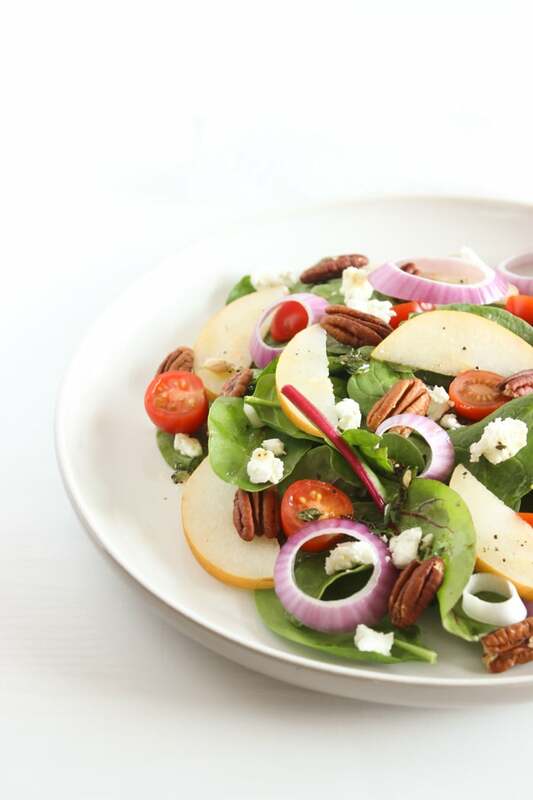 Baby spinach serves as the base of the salad and is topped with thinly sliced crisp pears, juicy grape tomatoes, crunchy red onions and pecans, and creamy crumbled goat cheese. As mentioned before, the variety of textures is one of the highlights of a salad and this recipe certainly has that part covered. The lemon thyme dressing is bright and aromatic, but not too overpowering, allowing the flavors of the fresh produce to shine through. I love adding herbs to dressings and thyme goes exceptionally well with goat cheese and pears. If you don’t have fresh thyme, don’t hesitate to use the dried herb, just be sure to reduce the amount. We’re almost near the end of pear season, but I’m still finding sweet and juicy Bartlett pears and subtly sweet and crisper D’Anjou pears at Trader Joe’s and some of the other local supermarkets. Asian pears, which is what you see in the pictures here, are available pretty much all year long, although you may only be able to find them in specialty markets. If you’re not familiar with them, Asian pears look more like an apple than a classic pear, and are firm and crisp, which is why they hold up so well in salads. If pears aren’t your thing or you can’t find any good ones, a crisp apple would also work really well in this salad. As with most of my appetizer and side salads, this spinach pear salad with goat cheese comes together in 10 minutes and requires minimal prep. I like to toast the pecans to bring out their flavor, but you can easily skip that step if you don’t have the extra minute or two to spare. This recipe is naturally gluten-free and vegetarian, and if you’re vegan, you can leave out the cheese and swap maple syrup for honey in the dressing. One last note: most kids don’t like the bite of raw red onions, so you can easily leave that out or save it only for the adult plates. Do you find salad boring? How do you keep your salad recipes interesting? I love everything about this salad! Again who says salads are boring? I use to love goat cheese, well still do it just doesn’t love me, but might have to deal with a little discomfort for this one. This looks mouth-watering good! I love fruit on salads, but don’t think I’ve tried pecans before. Thanks so much Kerri! I love the crunch of pecans in my salads. Hope you give it a try! I love the vibrant colors in the salad! Very refreshing and perfect for Spring! Thanks so much Sara! Hope you enjoy! Ohhh so delicious!! This has all the makings of a great salad! I love pears too. Thanks so much Julie! I hope you give it a try before pear season ends!! Salad is never boring to me! My problem is that I feel like restaurants make them 1 million times better than I do! LOL! I love how light and refreshing this one is! I’m so glad you agree that salad isn’t boring! That’s so interesting – I find some restaurants make awesome salads, but often I’m disappointed by the ratio of greens to toppings, lol! WOAh that vinaigrette sounds SO good. I mean, all these flavor combos are spot on, but lemon thyme?! Sign me up! Thanks so much Chrissa! I love making homemade dressings with different herbs – they are so yummy! Can’t wait for you to try it! I love the pear and goat cheese combo! Sounds delicious! Thanks so much Erin. It’s so yummy! I love this! And I am a sucker for salad! I’ve been twisting it up by adding Enlightened crisps on top for added crunch– and goat cheese crumbles of course! Thanks Liz! I love adding roasted beans to my salad too – such a great source of crunch!! This is definitely NOT a boring salad! It is gorgeous and I love the flavors going on! Makes a great lunch or light dinner! Thank you so much Taylor! Enjoy! I can never get bored of salads, there are just wayy so many variations!! How could you get tired of them?! Thanks Christina. The dressing is super yummy! Hope you enjoy! Thanks Esther – I agree fruit and cheese is mmm mmm good! This dressing sounds devine! Can’twait to try! Pears and goat cheese are such a great pairing. This lemon thyme dressing though…Hello! This looks great. I agree Kristina! Thanks – can’t wait for you to try it! I love this wonderful combo with pecans, pear, goat cheese…. I’ve been really into salads lately (warm weather in So Cal) and can’t wait to try this one! Thanks so much Lauren! Wish we had some warm weather here in NY, but I still try to eat salads as much as possible for lunch even when it’s cold. Enjoy! This sounds fabulous! I’m really into the combo between slightly bitter red onions and sweet fruits like pears and apples in salads. It just tastes so good together! Thanks so much Chrissy! I agree – fruit and onions are a great pairing! I’ve never thought of putting fresh thyme in salad dressing! I’ll have to plant some this year. Also LOVE goat cheese in salad! Can’t wait for you to try it Bridget – I love adding herbs to dressings! All my favorite salad ingredients! Yum! Thanks so much Mona! Enjoy! Thanks Abbey!Just had it with dinner the other night – was so delicious! Now to find some Asian pears!! I found them at Trader Joe’s if you have one around. Otherwise, you can really use any pear – bartlett and d’anjou are delish too! Yum! I love goat cheese on salads! I just actually fixed something very similar with dried cherries in it too! Dried cherries would be a great addition here too! I agree Natalie! Thanks so much. And yes, love the addition of fresh herbs in salads and dressings! Wow, this looks so light and fresh!! I’m still going strong on salads despite it getting cold out..but I think I’ll be moving into all the soups soon. It is! I can eat soups and salads all year long, but I definitely prefer heartier salads with roasted veggies in the winter! Salads are always exciting to me! I love using spinach as the greens too for extra nutrition! I love that you find salads exciting! I do too – just made a new one last night and was so excited about it, lol! I’ve never had goat cheese. True story! This salad looks delicious!! This salad looks just lovely. I didn’t try pears and spinach together until last year, and they are so delicious together! This salad is calling my name! It looks so good! I love everything you have in it! The textures are amazing too! Thanks so much. I love to have a variety of textures in my meals. Makes every bite so much more fun! This salad is so Fall and I love it! Thanks Katie! I have another super delish fall salad coming this weekend too – you must come back to see it! Thanks Amy! Hope you give it a try. Thanks Stacey. The dressing is especially good. Oh wow…the flavour combo though! Amazing. This salad looks anything but boring!! I have some fresh thyme in my garden that is going straight to this dressing recipe! Can’t wait for you to make the dressing Whitney. Wish I had some fresh from the garden thyme too!